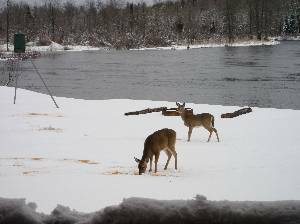 Cross country skiing, wild life, fishing in the river in front of lodge, also little bay de noc. Just a beautiful place! Nice and pieceful. Has everything you need for a perfect vacation. Everybody in my party had a wonderful time. As soon as we stepped out of our cars my adult children said they are never leaving the lodge. It was clean and had every thing we needed. There is a family of eagles we watched teaching their baby to fly and we saw one of the parents catch a fish right in front of the lodge. We will be going back. We had a wonderful vacation at Chippeny Creek Lodge. My husband hails from Michigan and extolled the beauties of the Upper Peninsula to my family. He was very convincing because my sister, her husband and all of her adult children from various parts of the country agreed to give it a try. I can tell you that it was an overwhelming success. The interior of the lodge was great. We had 10 adults and 1 child and had no problems with having enough room. We were all able to sit around the table in the great room for dinner each night. At night we would head to the fire pit for smores and a beautiful look at the starry sky. The location was very convenient. We were close to Escanaba--for shopping and a beautiful beach. Also, we were able to do some hiking and head up to Pictured Rocks. There was a ton of information at the Lodge on all of the local attractions. All in all I would say that this was a fabulous vaction for all. We are planning on coming back next year. We want to thank you for a wonderful vacation. We enjoyed the feeding of the deer every morning and the warm cookies upon our arrival. We enjoyed the snowmobiling and the wildlife. Your hospitality was absolutely great. We were relaxed and refreshed from our stay at your log cabin. We would recommend this spot to our friends and family. Thank you for your warm welcome and your cabin to enjoy. 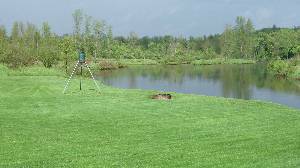 We hope to return in the near future, possibly in the summer to fish the river. We had a wonderful time at your cabin in Rapid River. It was a perfect location and facilities. The boys were disappointed on the high winds to get out on the water. The two young boys enjoyed themselves on the river catching a few prizes. We girls just relaxefd and went jogging every morning. I'm sure Mike will call for later this year to fish the salmon when they come up the river. We all voted on making this our destination on yet another vacation. On behalf of the Buell families, thank you for such a great time. 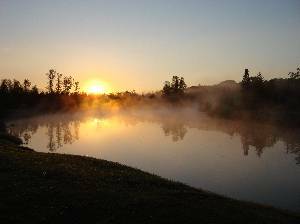 If you are looking for a peaceful place in the wilderness full of wildlife, then Chippeny Creek Lodge is for you. 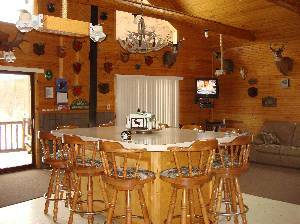 Without an prior knowledge of the Lodge, we chose Chippeny Creek Lodge from the internet for our snowmobiling and ice fishing trip. We couldn't have choosen anything better. The comfortable nature and convienence the Lodge has to offer made up for the poor weather conditions (warm temps) we faced. Each member of our group continued to comment on the beauty of the Lodge and it's surroundings. Many had never stayed anywhere so nice. The wildlife were amazing. Having a Bald Eagle fly within 10 yards of the porch at eye level is something most people will never experience. 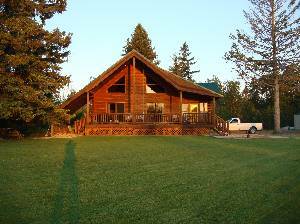 I'm sure we'll call on Chippeny Creek Lodge for future trips to the area. Thank you for making your place available. Great experience! Sharon and Dean were very helpful and accomodating. The location is definitly a plus for those who want to get away. We visited in the dead of winter and were very comfortable throughout our stay. We hope to come back soon. Wow! is all we can say to the beautiful stay we had at Chippeny Creek Lodge. Everything you could want is here, so clean, peaceful, and more peaceful! Wish we were there right now! I am a self employed engineer and travel throughout the U.S. Last summer I was fortunate enough to be working in the Escanaba area for the entire summer. My wife,mother-inlaw,and youngest son had the greatest summer of our lives. I was fortunate enough to have contacted the Bocklunds and secure their beautifull Chippeny Creek Lodge for the majority of that time. I have never been anywhere like this before. The cabin is very secluded, and awesome. I caught big northern pike, smally's and walleye. 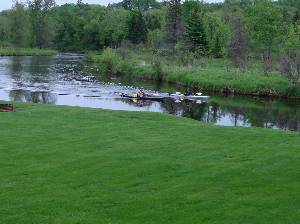 The best part is that they're right in your front yard(White Fish River). Having bald eagles within 50 yards of your front door was something I never would have thought I'd have seen. Being an avid hunter, and seeing large numbers of turkey and deer all around the camp made me want to spend some time there in the fall and winter months. We are returning for a week in august and I can't wait. If you love the outdoors and want to stay in a beautilul new cabin, don't pass on !! !Chippeny Creek Lodge!!! We want to all thank you for giving us the opportunity to experience what we call "A Little Piece Of Heaven". We have had such a peaceful, stress-free week here.It's absolutely beautiful. We have seen so many deer, fawns, geese, eagles, a huge turtle, fish we have never seen before and even caught a 21" small mouth bass out of the river. We have seen turkeys in the front yard. 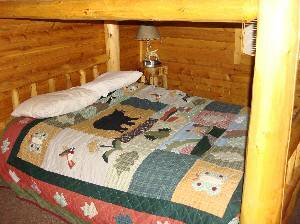 The lodge is wonderful with all the room we needed and so comfortable, right down to the flannel sheets on the beds. We hope you find the lodge as you left it. This may be a place we never see again, but will never be forgotten. Thank you for being such a pleasure to meet. Yours truely, the Sundstroms and the Rowlands. I want to highly recommend the Chippeny Creek Lodge. We were there this past Valentine’s Day Weekend and had an amazing time. We had planned to go snowmobiling and skiing, but the lodge was so nice, we stayed in practically the entire time. There is abundant wildlife that comes up a few yards from the door to feed. And if you want seclusion, this is definitely the place. The driveway itself is a mile long! Dean and Sharon were very kind and hospitable to us and told us to call if we need anything. The Great Room was incredible with the fireplace and satellite tv. In addition, the kitchen was stocked, not only with silverware, pot and pans, but with food and condiments as well! I couldn’t think of anything that could have made our stay more enjoyable. We will definitely be coming back! The cabin was wonderful!! From the secluded hunting-lodge setting to watching the deer feed every morning...I couldn't have asked for a better experience. 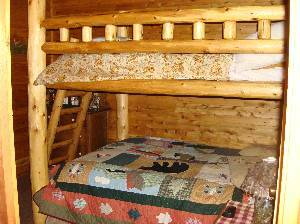 The owners of the cabin are extremely friendly and offered complete assistance with all aspects of our stay. Within driving distance of anything you want to see in the UP. THANKS for the memories!! Deposit: a deposit of half the fee is required , upon booking, the other half plus the surety must be paid one week prior before assuming tenancy. Cancellations and Refunds: There is a $50.00 cancellation fee for any cancellation and if you cancel within 30 days or less of your rental dates you would lose your 50% deposit unless we find another renter to fill your cancelled dates.If your cancellation is 31 days or more your 50% deposit will be refunded all but $50.00.